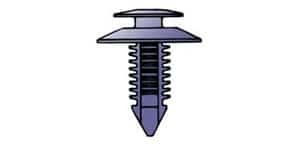 Christmas Tree® Clips – Single Head Unique ribbed shank ensures fast, easy installation and secure holding in a wide range of materials and material thicknesses. Several head and point styles available. Christmas Tree® Clips – Double Head A simple twist retains the clip in the primary panel. Second panel is then pushed onto ribbed shank to complete assembly. 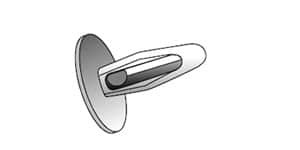 Christmas Tree® Clips – Quarter Turn A quarter turn retains clip in primary panel. Second panel is then pushed down onto ribbed shank. 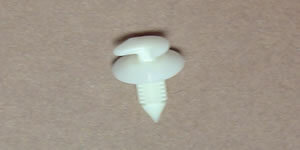 Christmas Tree® Clips – Double End One ribbed end is pushed into primary panel to retain clip. Second panel is pushed down onto projecting ribbed end to complete assembly. 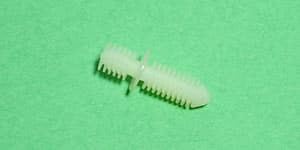 Removable, Non-Reusable & Reusable This ITW Fastex clip features a self-centering ribbed shaft that permits insertion and removal without damaging or distorting retaining ribs. Permits field removal and reuse. 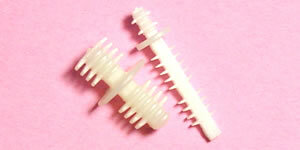 Ribbed Clips – Nylon, Double Ended When installed, these small units hold storage bin doors, CD-Rom doors and trays, computer covers, cassette doors, etc., closed. Device reacts to a slight push of the finger by slowly opening the unit. Another push causes the unit to close. 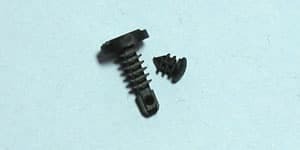 Canoe® Clips Low cost replacement for screws and rivets in lightwieght applications. 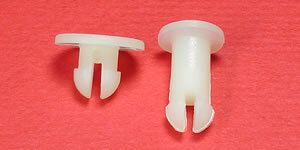 Clips snap easily into round holes to hold securely in metals plastic and other materials. Various head styles available. 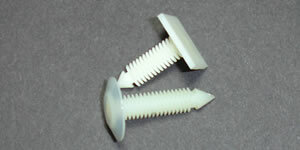 Stalok® Fasteners This snap-in ITW Fastex clip securely joins two panels. 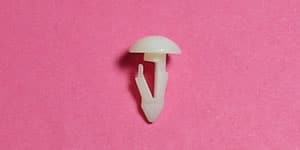 It is non-removable from the front but can be removed from the back. 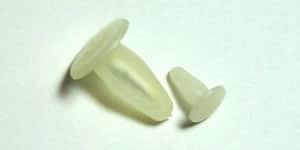 Nylon Push-in Clips Slotted shank compresses as clip is pushed into hole and snaps back after it passes through to secure the assembly. Hollow Shank Solid point facilitates assembly and enhances holding power.